The game of GO is one of the simplest games in the world played on a 19x19 grid board. The size of the board can be intimidating for a first time player, I know it was for me! This led me to try a few variants of the basic GO game several years ago. Unfortunately these early attempts were not sufficiently interesting, due to the basic game's simplicity. In 2016 an idea occurred to me to use additional neutral pieces that I call 'Henge' pieces. The word Henge, pronounced "Hain-gay" or 変化駒 in Kanji, refers to the changing nature of these pieces. Introduction of the Henge piece lead is the basis of my newest game, GoRoGo. The game was tested at the Tokyo Game Market in December of 2016 where it received outstanding reviews and was in high demand. 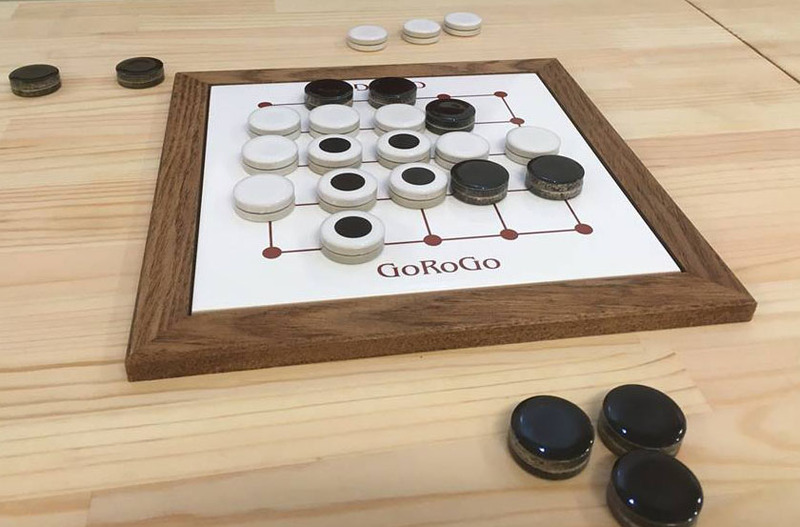 GoRoGo is a great option for those who are interested in GO but are hesitant to begin learning the full game. The "Henge piece" is the key to making GoRoGo an exciting alternative to GO. 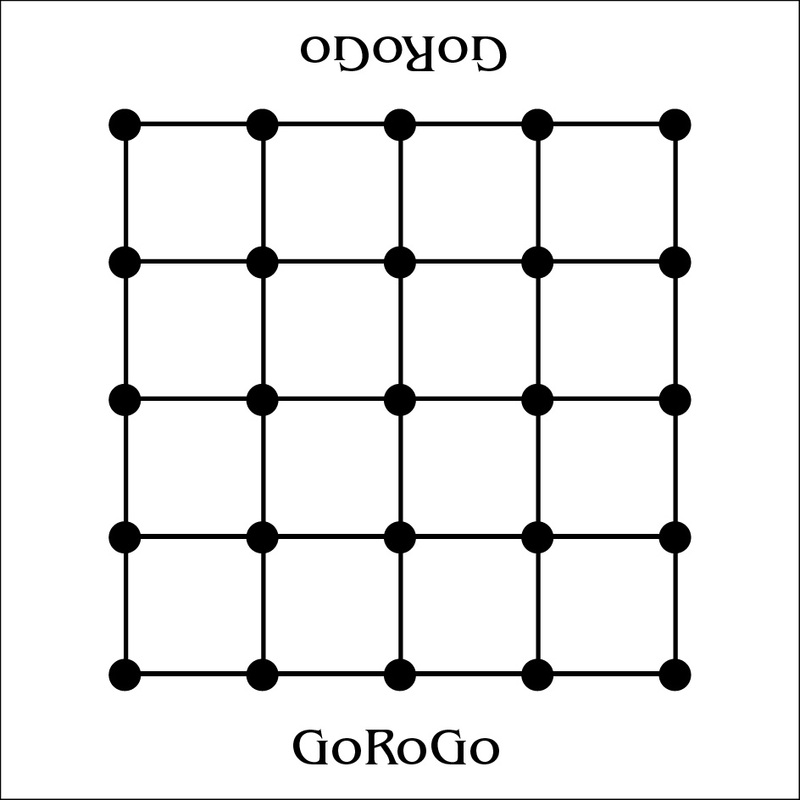 GoRoGo(五路碁) is a two player game with a total of 25 pieces (10 black, 10 white, 5 Henge) and is played on a 5x5 grid board. The compact grid board has the possibility of 25 interactions and 40 paths! The goal of this game is to obtain more of your opponent's pieces rather than trying to claim the most area (like the original GO.) Since the game has 25 pieces any game played will not exceed 24 moves. A player cannot pass or play a Henge Piece as their last move. If you don’t have a legal move, you lose. For those who are unfamiliar with GO. In Japan, we say piece(s) keep 'Kokyu-ten' (Breathing point) in the classic GO game. You create intersections to supply the connections with air, each piece needs air to live. If your pieces don’t have air (by being surrounded by the other players pieces) they die and are removed from the board and captured by your opponent. In other words, a piece or solidly connected group of pieces of one color is captured and removed from the board when all the intersections directly adjacent to it are occupied by the opponent pieces. ●Each player has their ten pieces and two Henge pieces, the remaining Henge piece is placed on the board by White to complete the board setup. ●Black begins play by either playing a black piece or a Henge piece and play then alternates between Black and White. ●Pieces cannot be moved once they are placed. ●A piece or same color group pieces chained with path(s) need one or more open intersection(s) linked with path(s). If they have no open intersection surrounded by opponent pieces, they are captured to be removed from the board as opponent’s score. ●The exception is the Henge pieces, they take on color of the player's piece as they take their turn. Black when black plays, White when white plays. Henge pieces can be placed on any intersection and can never be captured because of their shifting nature. ●You cannot place your piece in a position that is completely surrounded by your opponent's pieces unless it leads to capturing an opponent piece(s). Henge pieces however, can be placed at any intersection. ●You are not allowed to pass on your turn. If the player doesn’t have any legal moves, you lose. ●Players should use Henge pieces prior to their last move, if a Henge piece is used last, you lose. When all pieces have been played, the game is over. The player who has the most of their opponents pieces is the winner. If the score is tied then White wins the game. ●GoRoGo can be played quickly since it is played on a 5x5 grid board. Both players will play all of their pieces within 24 moves. ●Five Henge pieces are added to the game. They change depending on the player’s turn. ●Players may place a Henge piece that intersects with any piece with no restrictions. ●Henge pieces may not be removed from the board. ●The goal of the game is to capture more of your opponent’s pieces rather than capturing the most area as in standard GO. ●Passing on your turn is not allowed. If you have no legal moves. You lose. ●Players can’t use a Henge piece as their final move. Example of prohibited move by the white player. 1: You can’t place your piece anywhere that is surrounded by your opponents pieces. 2: You can place a Henge piece anywhere on the grid even if is surrounded by your opponents pieces. 3: As stated above, Henge pieces change their color according to the player. Therefore White can place his piece in the middle (as pictured below) because the Henge piece is considered “white” for their turn. An important thing to remember is that when the Black goes next the white piece that was placed can now be removed from the board since the Henge piece is now considered “black” for their turn. Capturing will occur automatically at next black turn regardless next black piece will be placed a distance or adjacent place. This is kind of suicide take but in some occasion it is available. If black player has no legal take, he loses the game immediately. He can avoid defeat of game. It is very effective when he obtains more pieces. ●The Henge pieces are both black and white. That is, on Black's turn, a Henge piece is a black piece. Then on White's turn, it is a white piece. This allows moves that are normally prohibited in GO, such as 'Kou'. A player can attack into an area that in standard GO would be protected. It stops endless recapture and ‘Kou’ doesn’t occur. ●Using Henge piece(s) creates opportunities that are not available in regular go as in the example below. In the play of ordinary GO white group is safe. But if black places a Henge piece on safe intersections. Then he can place his piece to obtain white pieces at his next turn. White pieces are captured by the surrounding black pieces. Free Print and Play board. Please try a game!